Dillon County 4-H would like to recognize and congratulate Izzy Freudenburg on being the 2017-2018 4-H Dillon County Winner for the Wildlife Plot Project! We would also like to acknowledge Alyssa Brigman for fully completing the project. This project involved hands on environmental learning about wildlife conservation, plant identification, and habitat management. This is recorded in a record book and there is a site visit. These must be completed in order for the project to be considered completed. Both girls did a great job! 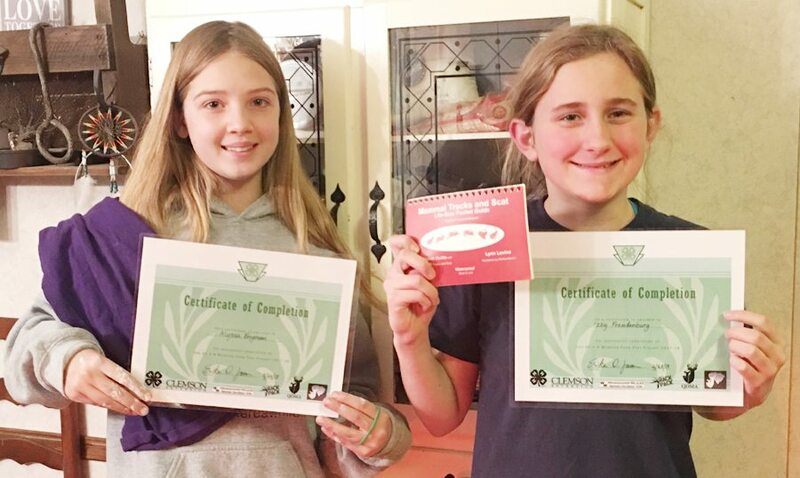 Many participants were successful due to being 4-H active members in the Latta 4-H Agriculture and Livestock Club, lead by Club leaders Mrs. April Brigman. This club focuses on hands on learning in agriculture and different types of livestock and wildlife. The Wildlife Plot Project will open again in July 2018. Please contact the club leader, April Brigman or the 4-H agent, Erika James at 843-774-8218 to enroll your youth in 4-H. To find out more about 4-H follow the Clemson Extension 4-H Dillon County Facebook Page. The Clemson University Cooperative Extension Service offers its programs to people of all ages, regardless of race, color, gender, religion, national origin, disability, political belief, sexual orientation, marital or family status and is an equal opportunity employer. Clemson University Cooperating with U.S. Department of Agriculture, South Carolina Counties, Extension Service, and Clemson, S.C.